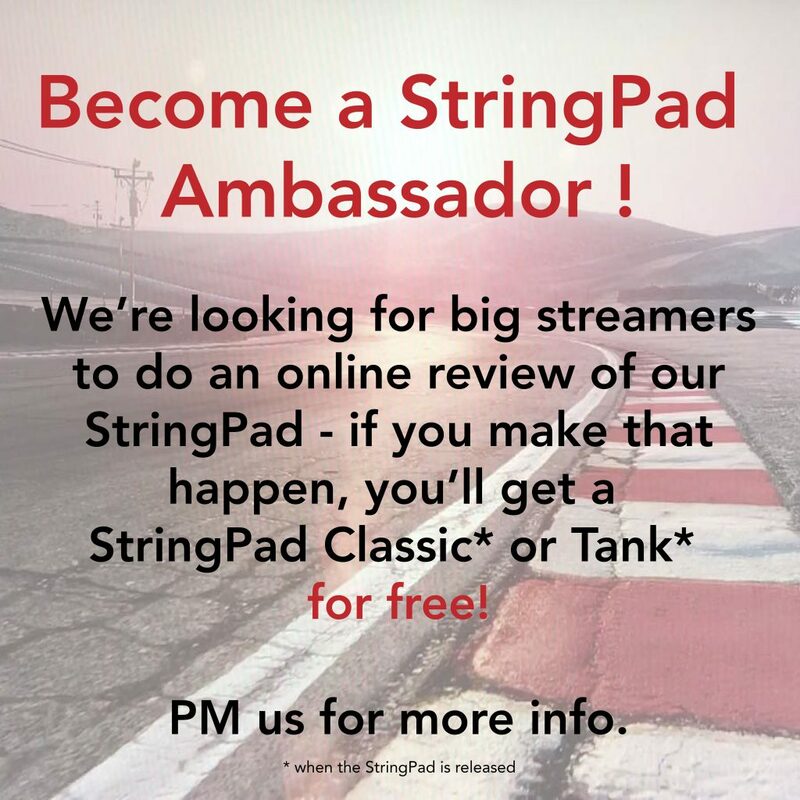 Become a StringPad Ambassador ! Let me start by saying you guys have been amazing and while it was clear who won the Tank Challenge, awarding the Classic Challenge was pretty hard and the race was very tight, so it took a lot of analyzing of all the data. In any case THANK YOU ALL for sharing and recruiting ! Giveaway Challenge Price 1 : a StringPad Tank* will be awarded, when it’s released to: BIJAN with 1.003 entries ! Giveaway Challenge Price 2 : a StringPad Classic* will be awarded, when it’s released to: Koty Schwarz ! Giveaway Challenge Price 3 : a StringPad Classic* will be awarded, when it’s released to: Clay Simmons ! Not to worry! We’re starting a new Giveaway almost right away that’ll run until our relaunch early 2017! * The StringPad versions in the prize box pictures may vary slightly in appearance (colour, print…) in reference to the actual awarded product. New article on StringPad on ZDNet.be ! 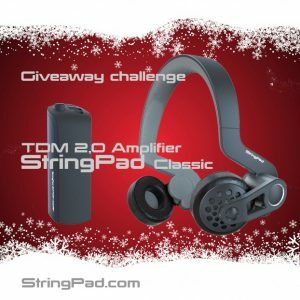 Summary: The StringPad immerses you completely into games and movies by letting the sounds and music actually feel. With virtual glasses, resolutions are getting higher and higher audio quality, we become more and more immersed in games, movies and music. Yet not our senses can be stimulated. You can’t smell the grass you ride on during a game and you can’t feel it when a monster jumps at you from behind. Belgians Partick Villas and Jean-Pierre Geelen, both designers of several successful products, have accepted the challenge to help the second issue of the job. The inventors started in 2012 with a first draft, then explored different ways to make you feel movements during games and movies. 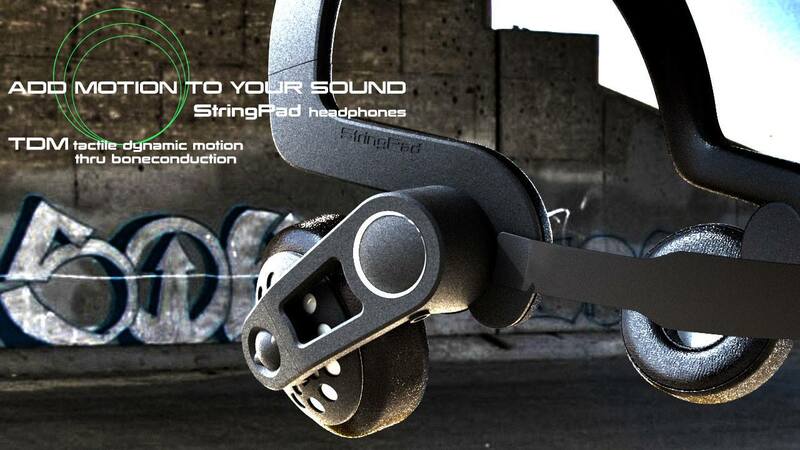 They finally came up with the idea to develop a motion simulating headphone, called StringPad. 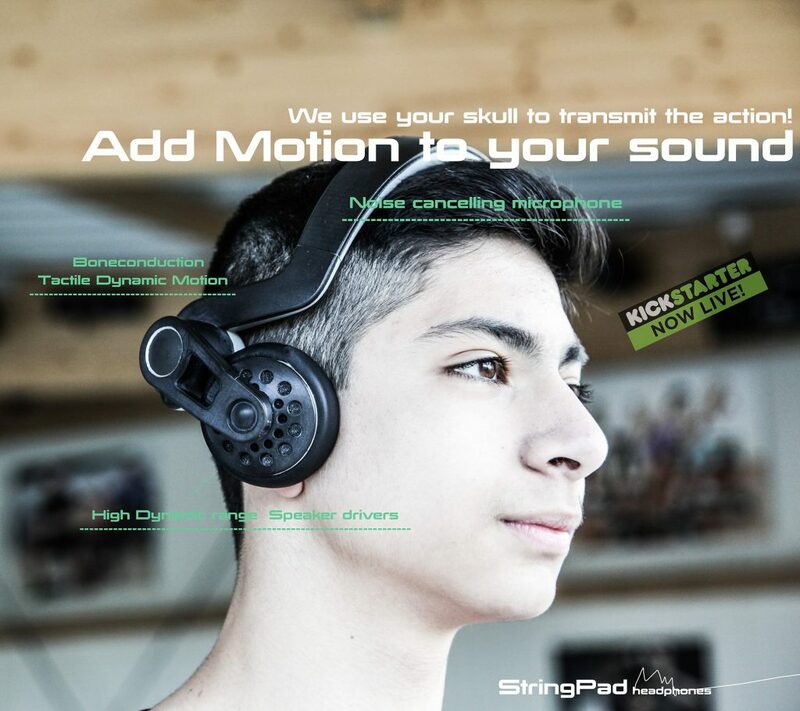 StringPad technology combines dynamic speakers with built-in bone conductors. These bone conductors give sound vibrations via bone conduction through to your inner ear. A two-way amplifier ensures that each signal is amplified separately. One signal is used for the sound, while the other will take care of the vibrations. Thanks to the specially designed amplifier, both signals can be controlled separately. The headset has on both sides two circular structures. The leading circles are the traditional valves headphones, which you should put on your ears and will provide music and sound. 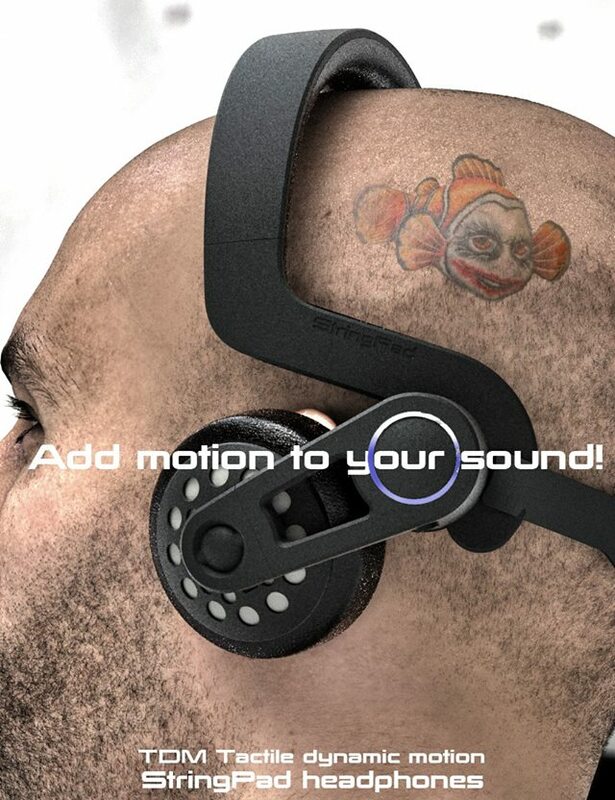 The rear circles are placed down on your skull and transmit vibrations. With these vibrations, you feel every gunshot during a shooting. Especially when you pair the headset with VR glasses, you will be completely immersed in the experience. 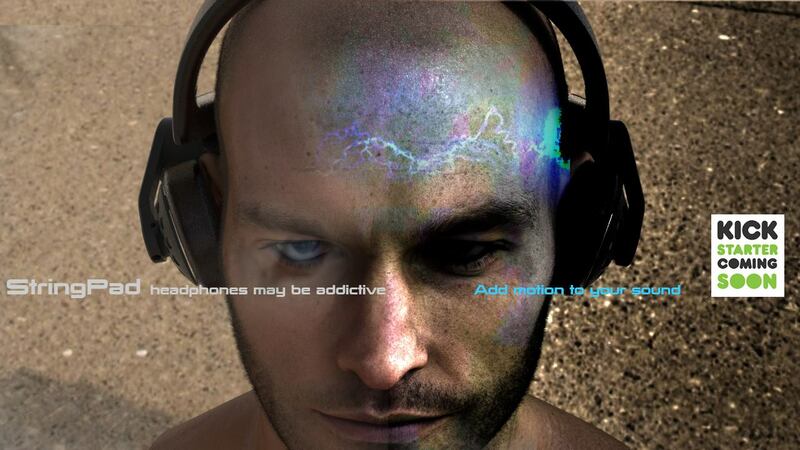 The vibrations ensure not only that your games are lifelike, but when you listen to music with these headphones will feel the bass effectively. This feeling is comparable to the effect of a powerful woofer in a larger audio system. Thank all you very much! See you early 2017! First of all, we are impressed by the interest in our project from people from all over the world so a big THANK YOU, especially to our early backers! While the campaign was running, we received so much feedback here and on social networks in personal messages, comments and emails. We came to the conclusion that the timing of our launch is off, mostly due to the Christmas holiday season. We were a bit too eager to bring StringPad to you and we were continuously working on improving the headset and the amplifier, and maybe not enough on optimizing its manufacturing cost. So while we now have an AMAZING product, we don’t have it at an affordable enough price yet. Also, one of the drawbacks of creating something completely new, is, well, that it’s new 🙂 so people want to try it out for themselves. So here’s what we’ll do : we’ll cancel our Kickstarter campaign for now and we’ll plan a series of open test days where people can come and test StringPad. We’ll also re-negotiate with our manufacturers to get you a better price. Since we have the headphones, the transducers and a brand new amplifier,our initial development and tooling costs are very high, so we’ll work on that. Then, we will relaunch our Kickstarter campaign with a new approach and a reduced pricing in the beginning of 2017. Thanks to you we have built a very strong community, and we believe that our relaunch will be a great success. We like learning from you and making our product even better. So please support us by sending your feedback on this campaign. Follow us on facebook, twitter, instagram and our website to stay tuned about the new campaign. Warmest regards and see you back on Kickstarter in early 2017 ! 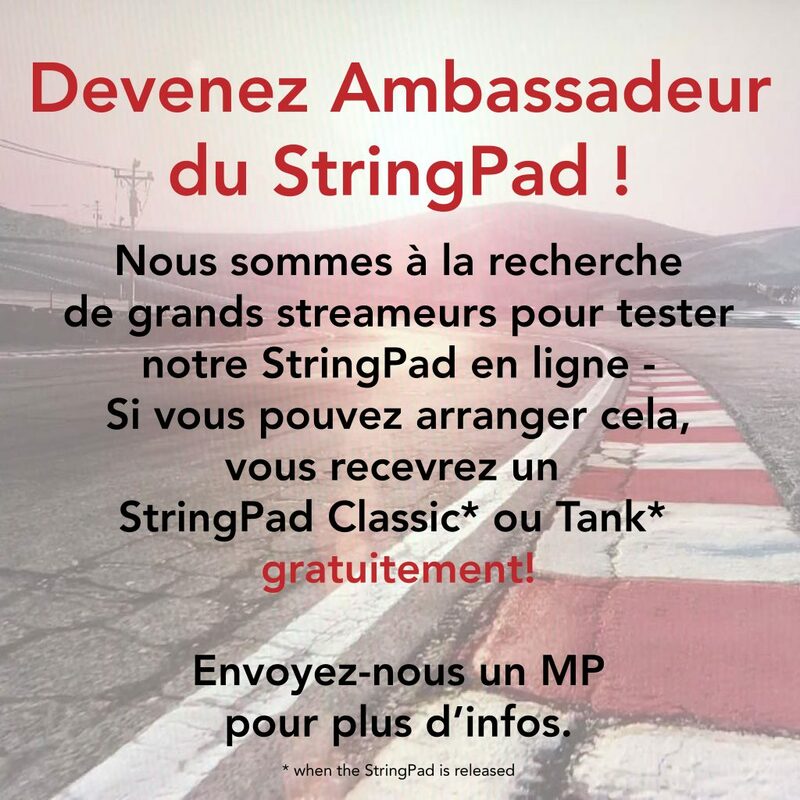 New article on Simrace-blog.fr ! StringPad headphones review on Majorhifi.com! Blog about StringPad by R3M Gaming! Register NOW for early bird discounts upon launch! Copyright © 2019 StringPad. All rights reserved.